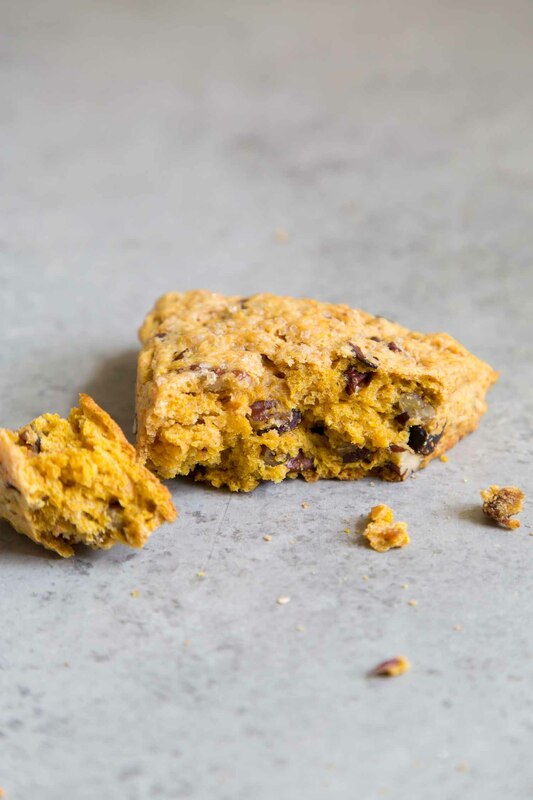 These pecan pumpkin scones are stuffed with dried figs and spiced with a mixture of cinnamon, nutmeg, cloves, and ginger. I love a good makeover. 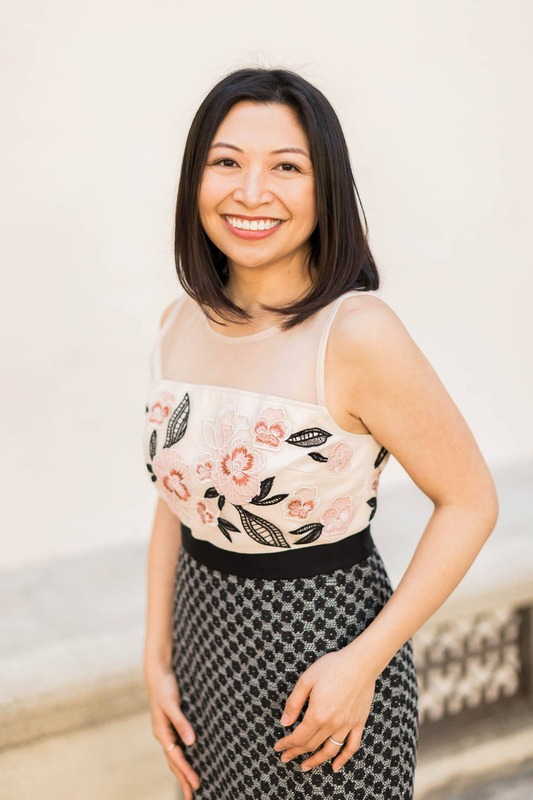 Whether it’s trying a different hairstyle, a change of wardrobe, or perhaps a new makeup color palette, change can be uplifting and revitalizing. The same can be true for recipe makeovers. Back in 2013 I made these pumpkin scones with maple glaze. While they tasted wonderful, the scones looked a bit odd. What was I thinking when I decided to dye the maple glaze orange? Not just any orange. Processed American cheese orange. Those strange orange pumpkin scones were not my finest moments. It’s time for a sleeker, more minimalist approach. Rich, moist, yet still crumbly. 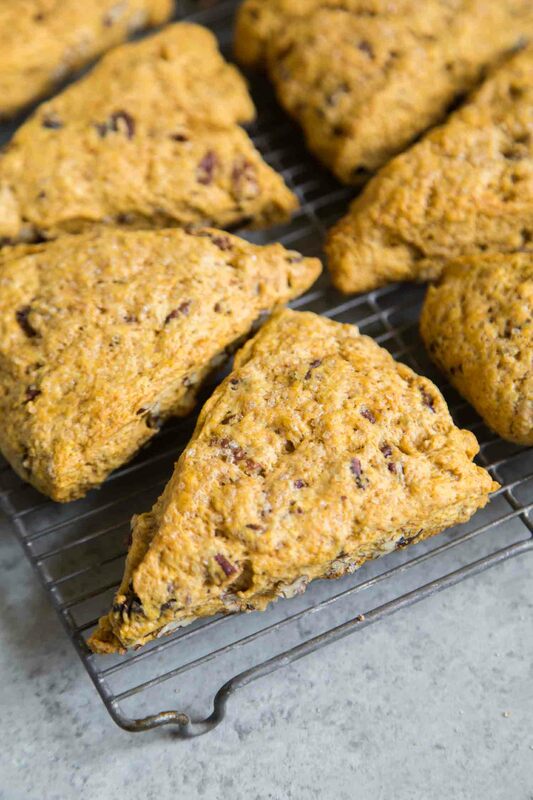 These are not your traditional dry scones. The addition of pumpkin puree adds moisture, while the butter adds creaminess and richness. The batter is tossed with toasted pecans and chopped dried figs. It’s a wonderful balance of textures and flavors. When it comes to making scones (as well as biscuits and pie dough), it’s best to work with COLD ingredients. Similar to pie dough, butter (or choice of fat like lard or shortening) is cut into the dry ingredients. This technique helps to produce that flakey texture. The little pockets of butter melt and steam during baking, helping to leaven the scone, while also those flakey layers. I suggest using a handy dandy pastry blender tool to cut the butter into the flour mixture. Otherwise, you can use two fork or simply work quickly and use your fingers. At this stage, the mixture should look like coarse, peddled sand. For extra credit, it’s also a good idea to chill the pumpkin puree. 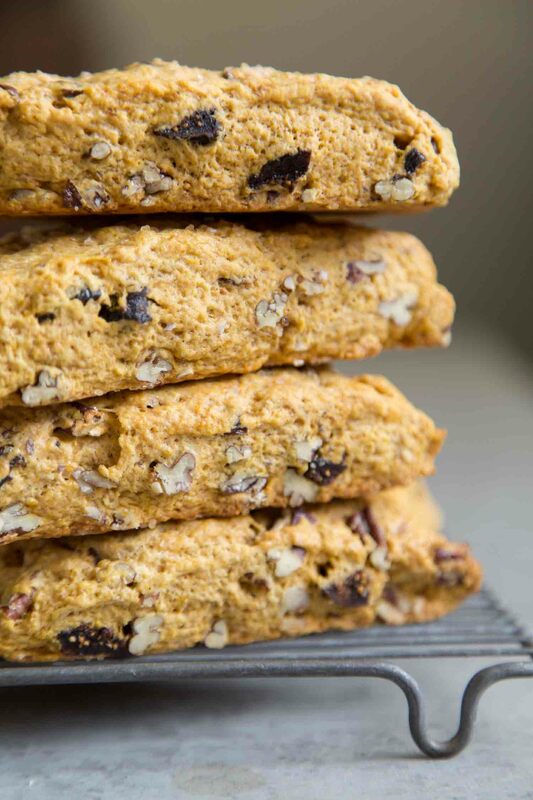 The scones are spiced with a mixture of warm notes: cinnamon, nutmeg, cloves, and ginger. Use pre-made pumpkin pie spice mix or make your own. Alternatively, free feel to stick to cinnamon. Since there’s more than enough going on inside the scone, I opted to keep these pecan pumpkin scones glazed. Before baking, the scones get a light milk wash followed with a sprinkling of turbinado sugar. 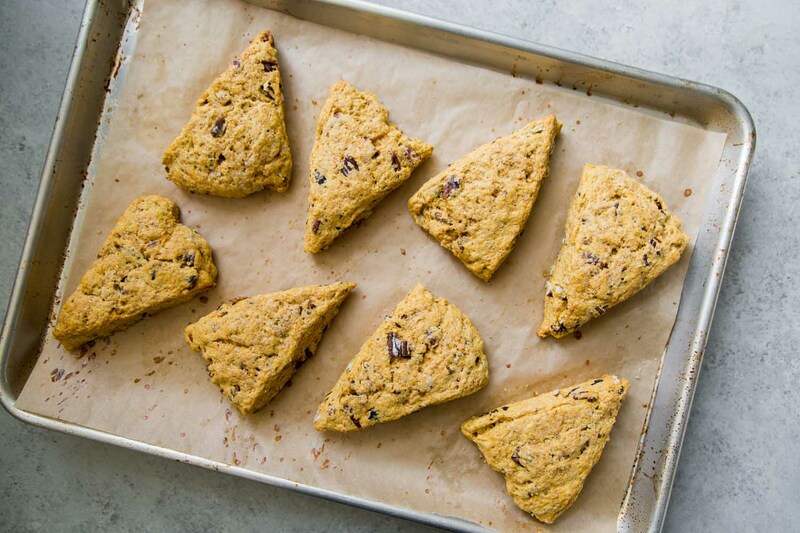 While these scones taste best the same day they’re baked, they will last stored at room temperature in an airtight container for up to three days. They will be a little crunchy on the outside and fluffy on the inside. Scones can be eaten at room temperature or reheated in the toaster oven. 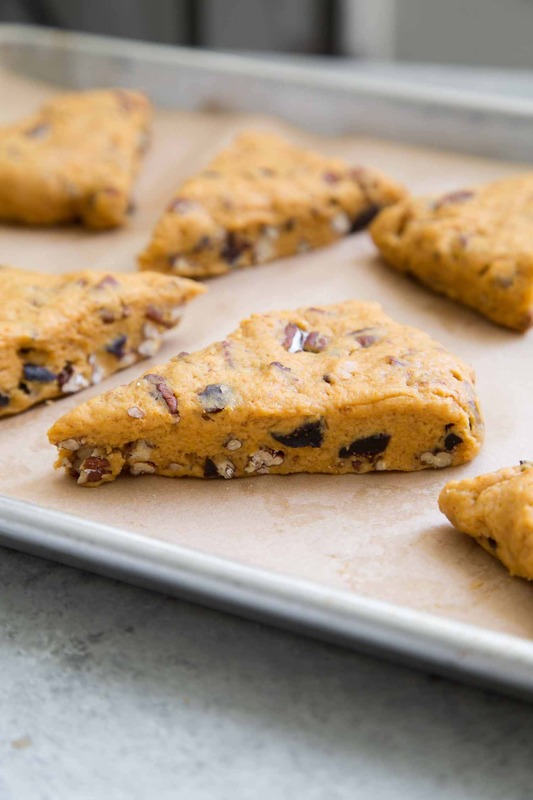 These pecan pumpkin scones are fabulous with some homemade maple pumpkin butter, some clotted cream, or simply with a cup of coffee. Stir together flour, baking soda, salt, spice mix, and sugar in a large bowl. Toss in cubed butter. Cover and let chill in the freezer for 15 minutes. Preheat oven to 350 degrees F. Line baking sheet with parchment paper or silicone baking mat. Set aside. Remove flour mixture from the freezer. Using a pastry blender (pastry cutter) or two forks cut butter into flour until mixture resembles coarse sand. Mix in chopped pecans and figs until well distributed. Add pumpkin puree and fold to combine until mixture is a "shaggy mess." Dump coarse dough onto a lightly floured work surface. Gently knead dough together. Dough will start off very dry and it will moisten as you knead. Pat dough into a circle with an 8-inch diameter. Cut scones into 8 equal wedges. 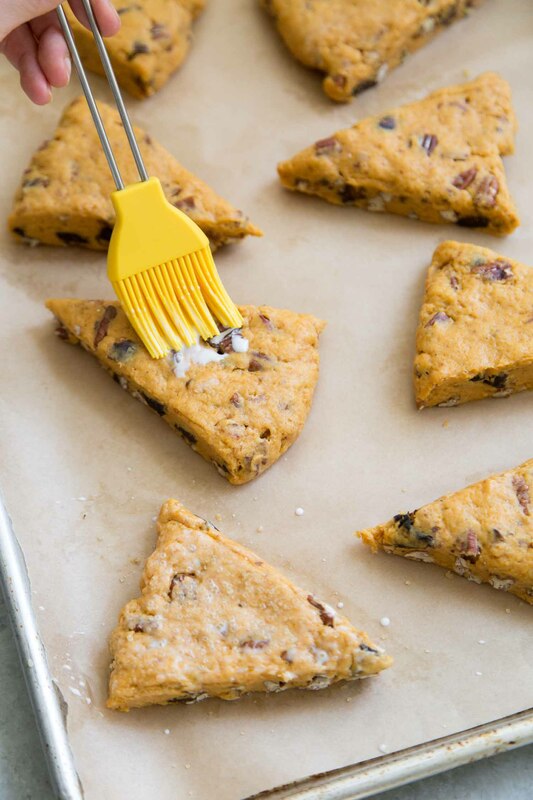 Transfer scones onto prepared baking sheet, allowing at least 2-inches of space between scones. Lightly brush scone tops with milk and generously sprinkle with turbinado sugar. Bake for 25-28 minutes until scones have puffed up. Let scones cool slightly on baking sheet for 3-5 minutes before transferring to a wire rack to cool to room temperature. Serve scones warm or at room temperature. Use store-bought pumpkin spice mix or make your own by mixing together: 1/2 tsp ground cinnamon, 1/4 tsp ground/grated nutmeg, 1/8 tsp ground cloves, 1/8 tsp ground ginger.